All Bare Root Pear fruit trees certified virus free, Free UK Mainland Delivery with a FREE FRUIT TREE WARRANTY. Pear Maiden trees are 1 - 1.5 years old when sold, with 3 - 3.5 year old roots grafted on, all other Pear bare root are 2 - 2.5 year old trees with 4 year old roots (arguably a 4 year old tree). 1-3 years on average to produce fruit (depending on root stock). All basic pruning requirements completed before delivery. Tree consultant available to answer questions pre and post purchase. WHOLESALE PRICES AVAILABLE FOR ORDERS OVER £150 Call 0800 043 1057. 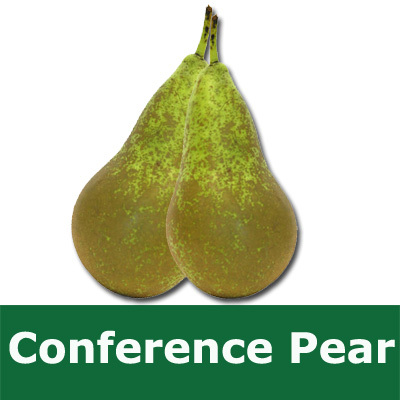 Conference pear trees are quite possibly the most popular pear tree we sell and you can see why. It is suitable for almost all UK locations in terms of weather (Light house patio gardens and severe weather research stations not included!) and the large and reliable crop of pears make it even more an attractive option. Compared to other pear trees, the Conference pear has good resistance to Mildew and Scab. The emphasis here is resistance not immunity so good practice still applies such as not pruning when wet and windy. The Conference pear tree is also a good attractant of birds, insects and wildlife so if you like a busy garden in the Spring then a Conference pear tree will help bring them in. We do not include Romany travellers, the homeless and some politicians in our description of wildlife, just the creepy crawlies and flying kind. Fertility: C3 (SELF FERTILE) Does not require another pear tree to produce fruit however an increased yield maybe had by putting another pear tree (not Conference) from flowering group C2,C3 or C4. Quince Eline	: Almost identical to Quince C but but has superior cold hardiness. Kirchensaller: Will reach approx. 6.0+ metres. Half Standard: Trunk clear of branches for around 1 metre and is traditional tree shaped. Good for gardens e.g. easy mowing and companion planting underneath. Straight Lead: Much more of a clear trunk than a Half Standard, usually around 2.0 + metres. Bush : Pruned so that branches start around 45cm from the ground. Bare Root : There is no soil or pot around the roots which are wrapped in a bag and are cheaper than containerised. Family Pear Tree. Three different varieties of pear on one tree that pollinate each other. Click the link to see current Family Pear Trees in stock. The general rule of thumb with most fruit trees is that the smaller the ultimate height of the tree, the sooner it will bear fruit. Pear trees around 2.5 metres could fruit in 1-2 years whereas those at 6+ metres could be as much as 5 years. Weather can increase or decrease these times.